Check out photos from this year's Pat's Run in Tempe. Nearly 30,000 members of the community took part in the 2017 Pat's Run — the annual race honoring the legacy of Sun Devil and soldier Pat Tillman — in Tempe on Saturday, including a special group of 50 participants wearing shirts inscribed with the names of people who've served as inspiration in their lives. The members of Team 42 got their shirts Friday evening and wrote the special names on them. Here, a handful of team members explain whose name they wrote and why. The annual race, which also honors all who've served and those who support them, is the signature fundraising event for the Pat Tillman Foundation, which provides scholarships for veterans and their spouses. A number of shadow runs around the U.S. in late April accompany the event, which traverses 4.2 miles in Tempe — symbolizing Tillman's No. 42 jersey as a member of the Arizona State University football team from 1994-97. He went on to play with the Arizona Cardinals, leaving his NFL career after 9/11 to join the U.S. Army. The events commemorate the day Tillman died in 2004 in Afghanistan serving with the 75th Ranger Regiment. The Pat Tillman Veterans Center also honors Tillman's legacy, providing a number of veteran support resources. It has locations on the Tempe, Downtown Phoenix, Polytechnic, West and Lake Havasu City campuses, as well as an ASU Online component. For more information about the center’s services, click here. Explore the fun and activities from this year's Pat's Run in Tempe in the slideshow below. Kathi Rottener (left), 60, of Beverly Hills, and Dede Drunker, 59, of Oak Park, California, show off their running gear before the start of the annual Pat's Run in Tempe on Saturday morning. ASU alumnus Jacob Gallaher, 32, holds a U.S. flag before the start of Pat's Run on Saturday morning. Runners gather to read the names of fallen soldiers before the start Pat's Run in Tempe. Sparky greets the first wave of runners at Pat's Run in Tempe. ASU theater junior Alicia Doten gets a selfie with Arizona Cardinals running back David Johnson at Saturday's race. Sparky leads runners as they head out of the start line during the annual Pat's Race on Saturday. More than 28,000 people participated in Pat's Run on Saturday in Tempe. The first runner crosses the Mill Avenue bridge less than 10 minutes after the start of the race. Runners cross the Mill Avenue bridge. The race's 4.2-mile length symobolizes No. 42, Pat Tillman's jersey number while playing for the Sun Devils. ASU journalism junior Josh Cutlip gives thumbs-up as he crosses the Mill Avenue bridge during Pat's Run on Saturday. Pitchforks are also a popular gesture among race participants. Pat's Run participants enter Sun Devil Stadium for the last stretch of the race, which traditionally ends at the 42-yard line. Runners get high-fives from the ASU football team as they reach the end of Pat's Run. Twelve-year-old Zach Hutchins is the first child to cross the finish line at Pat's Run. Navy veteran and Anthem resident Paul Wagner stands on the Sun Devil football field after completing the race. ASU football players Brycen Drenon (left) and Daniel Sanders-Effiong play beanbag toss with Christian Fernandez after the end of Pat's Run. Autumn Koenig (left) and her cousin Sadie McGuire play under a parachute tarp during the family-friendly activities after the race Saturday in Tempe. Four-year-old Johnny Cruz learns how to use his hula hoop from ASU community sports management junior Diego Ley while participating in an obstacle course for kids after Pat's Run on Saturday. The Larson family takes a photo with Arizona State football players after Pat's Run. ASU wide receiver Hunter Allen autographs the shirt of 1-year-old Mateo Diaz at the family-friendly celebration after Pat's Run. “We value entrepreneurial thinking within the arts and hope that ‘No Vacancy’ will cultivate lasting relationships and opportunities for collaboration with local artists and members of the community,” said Nichole Perlberg, HADES president and a student studying performance and movement in ASU’s School of Film, Dance and Theatre. HADES has partnered with local artists and with the FOUND:RE Hotel in downtown Phoenix to produce the event, which offers a unique opportunity to experience art with the artist present. The interactive event features local art and artists in the fields of dance, music, spoken word, contemporary fine arts and performance. Artists include Dom Root (Dominique Flagg), H/\rvey (Meghan Harvey), Desert Rain (Rain Locker), YNOT (Anthony DeNaro), CONDER/dance (Carley Conder) and KAYUN (Carol Wong). Each artist has curated his or her own show within the hotel space. Guests will be led on a tour in small groups through a sequence of spaces including a poolside studio, an outdoor pool area featuring performance and live music and three hotel rooms. The hotel will be providing access to a full-service bar and invites guests to experience globally inspired cuisine at their restaurant, Match. Other sponsors that helped HADES create and produce “No Vacancy” include Blackhawk Wealth Management, Galvinize and Nuebox. “No Vacancy” will be from 6 to 10 p.m. Sunday, April 30, at the FOUND:RE Hotel. Tickets may be purchased online at eventbrite.com. For more information and biographies of participating artists, visit the “No Vacancy” Facebook and Instagram pages. 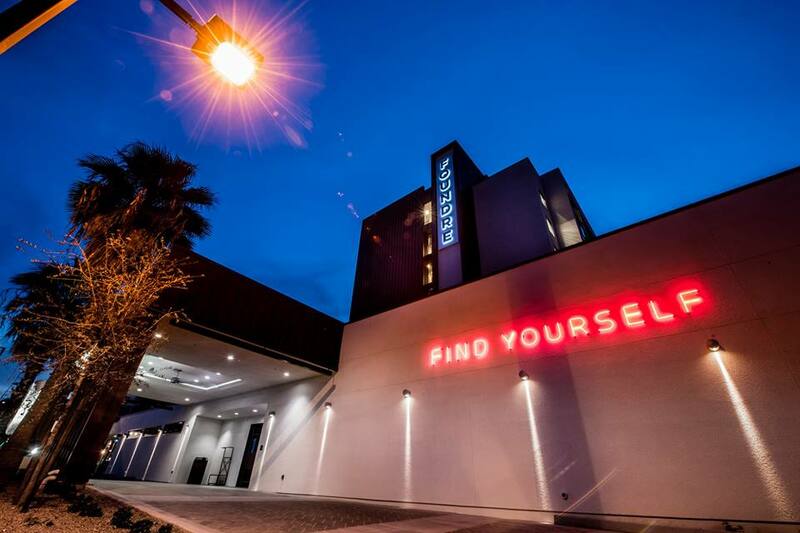 The FOUND:RE Hotel is located at 1100 N. Central Ave. in Phoenix with direct access from the light rail. Ridesharing or public transportation is encouraged as parking will be limited. The event is for age 18 and older.